And apologies for another post-n-run, but I need to get to bed. G'Night! They are nice athletic sandals and attractive for what they are, but it sounds like you don't need that style? If they don't serve a purpose, then it sounds like you are right to lean toward returning. I don't know what to say Amiable. I'm a bit of a gear girl but how much gear is really necessary with your life style? I read this as gear and I'm on board with that however I've found that I need very few and specific pieces to fulfill that requirement. Comfort is very important and in my neck of the PNW this is the norm and they do look great on your feet. Would you wear these to church, shopping or just chasing the kids around the house? Well, hmm.... I'm not sure where I put the receipt! (Aak). The sandals these could replace were worn to death. I wore them at least 3-4 times a week for 5 months a year. 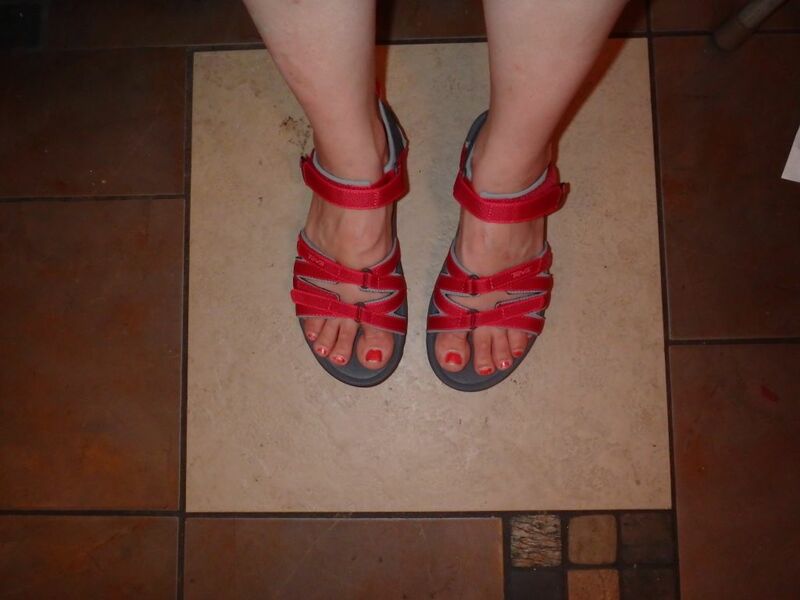 But my style is changing, and I'm not sure I'd wear Sporty sandals over my somewhat more refined alternatives. I think that's my main hesitation. (And I ended up with a bag from my friend, so I'm pretty sure she has the bag with the shoes receipt in it, so I should be able to retrieve it). I have two pairs of gear sandals like this, and I have worn the heck out of them since 2007. Having a sandal that you can get wet is a super bonus in my opinion. I wear mine on the weekends, after work, in the garden, etc. I have a pair exactly like this in black with purple piping. I love them and wear them numerous times a week on our evening walks. They are super comfy and terrific as a MOTG to the park, beach (waterproof, which my dressier ones aren't) zoo, etc. I do prefer my dressier sandals even for just a BBQ, but in my area, these would be totally appropriate for most casual get togethers. That said, you are hesitating. That makes me think you are not in love. Yet, you wore your last pair out. So I wonder where your hesitation is coming from. Is it the sandals themselves? The price? Or maybe you want a change? I think a great gear sandal that can go anywhere is a great addition. These ones are a lovely colour as well. You mentioned you wore your last one's to death. Maybe give some thought as to how often you might reach for these versus the danskos. These are really smart looking gear sandals. They're not too clunky and they really suit your foot. No, they are never going to be dress up shoes, but they sure would look good with casual wear. If you need a waterproof sandal I think they are great. If you dont need something waterproof (like another pair you have is waterproof) I would consider returning. I have found that a non-gear looking shoe ups my whole casual look and have bascally considered a refined shoe to be game changer for me. It sounds to me like you are headed that direction (not that your shoes would be a dainty as mine, perhaps yours would be RATE etc. but that the shoe sets the tone for the outfit and once you have gear on your feet it is hard to make you clothes look intentional in a different direction) if that makes any sense. 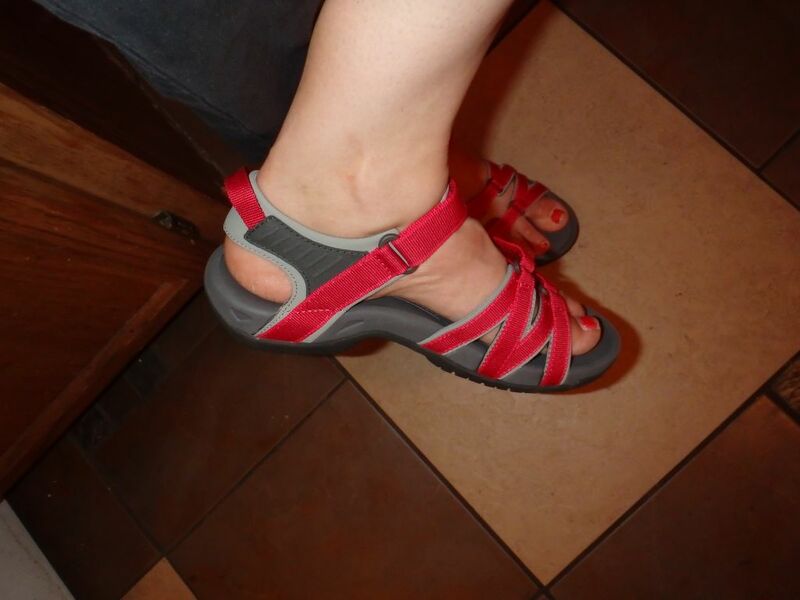 Also, since you know the make and size Tevas are probably easily stalked online places like 6PM, REI outlet or Sierra Trading Post where you could get them on discount later if you truly regret returning them after a few weeks or a month and they arent available any longer at your local store. I wear gear sandals all the time, after work, for gardening, walking the dog, walking in the rain, going to waterparks (when the kids were younger), etc. This is probably the hole that your Keen sandals filled, and if you don't have another waterproof tough sandal, keep these. Your nicer sandals will last longer. Hmmm -- good points - I don't have another pair that are waterproof (at least not that also are walk-able/hike-able). Sarah A, and Thistle - you nailed my hesitations - I know my style is shifting (or rather that I haven't actually settled into any one style yet), and am not sure that gear-shoes are the way I want to shift, and the price is high for something that "it would come in handy" instead of "wow, I really need this". With your small children and active life, I think you can use these. You already know that you wear red sandals a lot. These are not so bearish that they couldn't be worn with skirts and summer dresses. However, if you have all bases covered happily, then return and you'll have some money if something else comes up. I vote yes if you need/wear gear type sandals, but for the price I would probably not keep these. You can often find gear sandals better priced on Sierra trading post, REI outlet, Amazon etc.. if they are not your primary need. I think it is time to sit down and prioritize your purchases. Since you're on a really tight budget, I know this is tough to do -- it is so much easier to go thrifting or to the sales rack and just find something. And if you are like me at the same stage in wardrobe building, you have so many wardrobe holes that it is very easy to pick up something that you could use. After all, you could use just about anything! Still....I think the trouble you are having now is not: do I need a gear sandal? But more, would I rather save that money for something that would move me further toward my style goals. And since this IS the life you are living, maybe it is best to keep. You will probably wear it to death, just like the last ones. Meanwhile, though, you can think about where you want your next big chunk of change to go -- and perhaps it should be towards something that will move you forward vs. something that is practical. Or, best yet, an item that simultaneously fulfills both functions. True, they can be tough to find. But they do exist. A girl's gotta have her RED shoe,right? ;). I'd say if your happiness factor is up the roof, then go for it. Unless budget IS in play, then only you'd know the priority of want vs need. Suz, you are brilliant. Thank you! You wrote exactly what I needed to iterate - I just couldn't get it out from rattling around my head. If I find the receipt, I'll return them. If not, I'll keep. That makes that decision easy. Now to think through my purchase "wish list" and prioritize. But I think a winter coat that will move me toward my style goals is going to be what I watch for. If this one was warm, I'd be stalking it. (In red).